“Wherever you go today, you find a Punjabi and Bangalore is no exception. They are everywhere.Punjabis are known for their affection, compassion towards one another and the fact that “they can make friends wherever they go”. Cuisines of Punjab are delightful as the flavors of the desi ghee and fresh spices moves in the kitchens.That explains opening of "punjabi dhaba" in every nook and corner of the country. 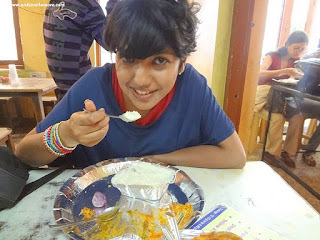 - Two days back,I had this awesome "rajma chawal" at my friends home,that even Bobby da dhaba rajma looks feekha(yes dips I tried it,the locations not the same,and the food's not as awesome as your ghar ka rajma chawal).I joke with her and family to open a dhaba somewhere,but thats how it is.Every dish is made with so much love that you get the real taste of it. Punjabis are the bravest and most courageous people in India. They are the defenders of the poor and protected the country for years from invading forces. -That explains why majority of the armed forces have them.Last year during my visit to drass war memo,I met a sardar,and his tragic story narrated in a funny way was cool enough to ease the tension on the borders. The word “Punjab” is made up of two Persian words -Panj- and -Aab-. Panj means five and Aab means water. This name was probably given to this land possibly in an era when this region came into close contact with Persia. The Punjab was known as land of five rivers because of the five rivers that ran through it. They are Jhelum, Ravi, Beas, Sutlej and Chenab. If its hot paranthas served with white butter and a delicious home made matha you're looking for,the place is a sure shot winner in serving delicious home made punjabi food.Though the newly opened bobby dhaba is not very easy to locate.The menu is very basic,serving few paranthas and kheer and buttermilk.Ambiance is not modern but reminds you of an old school Punjabi dhaba in the high-tech Bangalore city. The service was very quick and the moment we ordered within minutes we were served hot paranthas.Buttermilk/Matha was next.Palak saag and rajma followed.I loved the taste of buttermilk and I think most of us will agree with me if you've ever been to bobby da dhaba.The paranthas served with white butter was good. 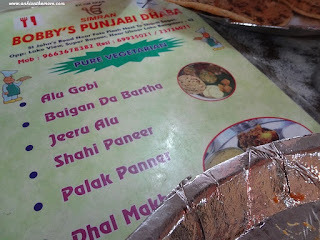 This was one place where I loved palak saag more than the rajma,both drenched in pure ghee.Kheer was awesome,if you ever visit bobby da dhaba,be sure to have the yumm buttermilk and the kheer. The funny part about bobby da dhaba is you have to have to order a parantha in couples,so if you want 2 mooli parantha with a single any other paratha,the order will not be taken unless you make up your mind to have parantha in duets :).The charge for a couple of parantha is Rs 60. 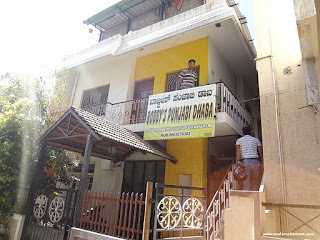 Disadvatage: Difficult to locate.For all the vegetarians, this is a place which you can count on in your good , bad,hungry and starving times.If you are low on cash and stay somewhere near to Ulsoor, head to Bobby Da Dhaba. Advantage:The kheer and matha was delicious.A must.The food needless to say is heavy and keeps you going for a long long time. Angeethi,MG Road: The lohri experience has been recreated at Angeethi-with punjabi countryside setting to the live bhangra performances and festival food. 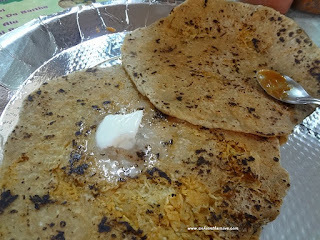 -Along with counters serving traditional punjabi staples,chaats and desserts,the chef at Angeethi will have seasonal specials like Makki di roti and sarson da saag and gajjak for you. -For non vegies,there's Madira mass(lamb chunks in brown gravy) and Matka Badami Murg(chicken in rich almond gravy). Disadvantage:The place was crowded and noisy,the food is delicious,the asli dhaba which brings its lohri special to foodies. Advantage:Located at MG road,in the heart of the city.Lohri special going on till Jan 22 with lunch and dinner specials. You are doing great work Anki. Really there are things you explained in your blog but didn't know by me.